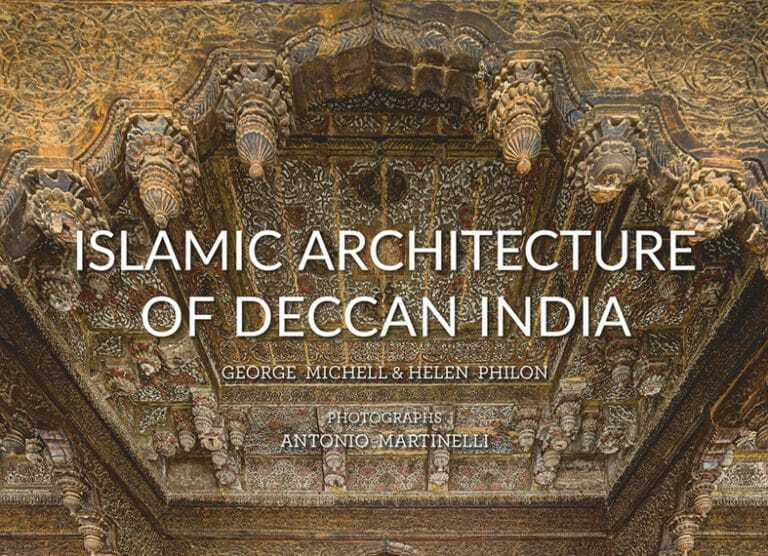 We are deeply proud to have supported a new publication of one of our partners, the Deccan Heritage Foundation: Islamic Architecture of Deccan India, by George Michell, Helen Philon and photography by Antonio Martinelli. The book is one of the first in-depth studies on the Deccan, including a major survey on unpublished Islamic buildings, and is illustrated with high quality full colour photographs as well as architectural plans for almost every featured building. In October 2013, we supported a four part lecture series by George Michell, Treasures of the Deccan. You can watch videos of these talks here. Find out more about the book as well as the extraordinary contributions to the study of the Deccan region by the three authors below. The buildings erected in the Deccan region of India belonged to a number of pre-Mughal kingdoms that reigned in the Deccan from the middle of the 14th century onwards. The monuments testify to a culture where local and imported ideas, vernacular and pan-Islamic traditions fused and re-interpreted, to create a majestic architectural heritage with exceptional buildings on the edge of the Islamic world. Many are still standing – yet outside this region of peninsular India, they remain largely unknown. General publications on Indian Islamic architecture usually devote a single chapter to the Deccan. Even specialist monographs can only cover a portion of the region, due to the sheer number of sites. While it is impossible to encompass the full breadth of the subject in a single volume, this book aims to embrace the visual diversity of the Deccan without sacrificing the rigour of academic study. Structures of historical or architectural significance are placed in their context, as the authors discuss building typologies, civic facilities and ornamental techniques, from plaster and carved stone to glazed tiles and mural painting. A chapter is dedicated to each principal Deccan site, interweaving the rise and fall of these cities with a pictorial journey through their ruins, and each building is accompanied by an overhead plan view. Dr Michell is a renowned authority on Indian architecture and art. Trained as an architect in Melbourne, he then studied Indian Archaeology and obtained a Ph.D. in 1974 from the School of Oriental African Studies. Since, he has lectured for institutions as such Cambridge University and the University of London and made a prolific contribution to scholarship; his publications include Royal Palaces of India (1993), Architecture and Art of Southern India, Vijayanagara and the Successor States (1995) and The Great Temple at Thanjavur: One Hundred Years, 1010-2010 (2010), Late Temple Architecture of India, 15th to 19th Centuries (2015).You can find a video playlist of his lecture series Treasures of the Deccan is available on YouTube. Dr Helen Philon is an archaeologist, scholar and lifelong academic with a MPh in Pre-Islamic Art from the School of Oriental and African Studies, University of London. She wrote her PhD thesis on Bahmani architecture in the Deccan, and has worked in the Middle East and South Asia, publishing work on architecture and ceramics. In 2011, Helen, together with Mary Anne Cordeiro and George Michell, co-founded the Deccan Heritage Foundation in the UK with its sister organization in India. Three years later in 2014, Helen co-founded the American Friends of the DHF with Tony Korner and presently serves on both UK and US boards. Antonio Martinelli is a photographer of international reputation, who has worked extensively in India, Europe, and Japan, and has published many works as well as produced exhibitions on architectural and geographical subjects. He graduated in Architecture from the University of Venice. Most notable of his many book publications are: The Royal Palaces of India (Thames & Hudson, 1994), Oriental Scenery: Two Hundred Years of Architectural Heritage (Citadelles & Mazenot, 1998) and Palaces of Rajasthan (India Book House, 2003). His latest book, Lucknow au Miroir du Temps (Filigranes Editions, 2011), is also the catalogue of the exhibition he held at the Musée Guimet in Paris. In 2014, The Metropolitan Museum of Art, New York, commissioned Antonio to photograph the art and architecture of the Deccan region. Read his interview here.